A guidebook is available that will help Delawareans protect and conserve our state’s vital wetlands. Just released, the Wetlands Public Participation Guidebook is a comprehensive resource developed to educate and inspire citizens to take actions to protect the health and productivity of the more than 350,000 acres of wetlands that cover our state. The guidebook is available online on DNREC’s new Delaware Wetlands webpage, www.dnrec.delaware.gov/admin/DelawareWetlands. Volunteers are the backbone of Delaware’s shoreline stabilization. Every spring since 1990, many dedicated volunteers have stabilized Delaware’s sand dunes by planting more than 4.8 million stems of Cape American beachgrass along ocean and bay beaches. Dunes are unstable – subject to the ravages of wind and water. Beachgrass helps build and stabilize dunes. Blades of grass help trap wind blown sand which can create new dunes and expland existing dunes. If you have questions about beach grass planting, or would like additional information about it, please call (302) 739-9921 or e-mail your questions to Jennifer.Luoma@delaware.gov. The Town Curbside Recycling Program is offered to town residents and property owners. Throughout the months of October to April, residential curbside pick up is every other Friday of the month. During the months of May through September, pickup is every Friday. Residents have received a 65-gallon cart on wheels for plastic narrow neck bottles, plastic grocery bags, aluminum, steel and empty aerosol cans, newspapers, junk mail and corrugated cardboard. Get all the “FAQs” including a sign up form and what you can and cannot recycle. NOTE: If you are not a resident or property owner in Incorporated Fenwick Island, you must contract with a private hauler to remove your recycling. Or, if you choose, you may bring your recycling to the nearest public service center. Q: What is considered yard waste and how do I dispose of it? A: You can recycle: Paper (newspaper, phone books, junk mail, magazines, cereal boxes and similar type boxboard, flattened corrugated cardboard, brown paper bags, paper gift bags – handles removed); Plastic (bottles – empty and rinsed lids removed, grocery and shopping bags); Metal (clean metal cans); Glass (clean clear, brown or green glass bottles). Q: What can I not recycle? A: You cannot recycle: waxed paper, aluminum foil, facial tissue, paper towels, butter tubs, yogurt containers, styrofoam, plastic drinking cups or lids, motor oil containers, pie pans, paint cans, scrap metal, lawn chairs, screens, window or door frames, window glass, drinking glass, glass cookware, mirrors, dishes and cups. Q: Is the Fenwick Island Lions Club still collecting aluminum cans? A: Yes. 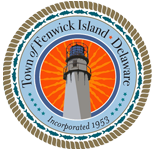 You can continue to support the Fenwick Island Lions Club by depositing your aluminum cans in the bin located behind Town hall and, during the summer, in the containers on the beach ends. We love the variety of birds and other wild life that resides in Fenwick Island. But some of these visitors can be a nuisance. Feeding of waterfowl is prohibited by Town Code. No person shall feed, permit to be fed or provide food for domestic or migratory waterfowl in lands either privately or publicly owned. Please! Don’t feed the ducks, geese or seagulls. Delaware’s Inland Bays consist of three interconnected bodies of water in southeastern Sussex County: Indian River Bay, Little Assawoman Bay, and Rehoboth Bay. The bays and their tributaries cover about 32 square miles and drain a land mass -called the “watershed”- of about 320 square miles. The Inland Bays are shallow, with an average depth ranging from 3 to 8 feet. Because the bays are so shallow, and because they are poorly flushed by tidal movement, they are especially sensitive to environmental changes. Increases in pollutants, changes in salinity and fluctuations in water temperature, for example, can have dramatic effects on water quality and on the plants, fish, shellfish, and microscopic creatures that live in the bays. The Center for the Inland Bays is an active partner with the Delaware Department of Natural Resources and The University of Delaware. Together these organizations monitor water quality and take pro-active steps to insure that everyone can enjoy the “other side” of the Delaware shore.